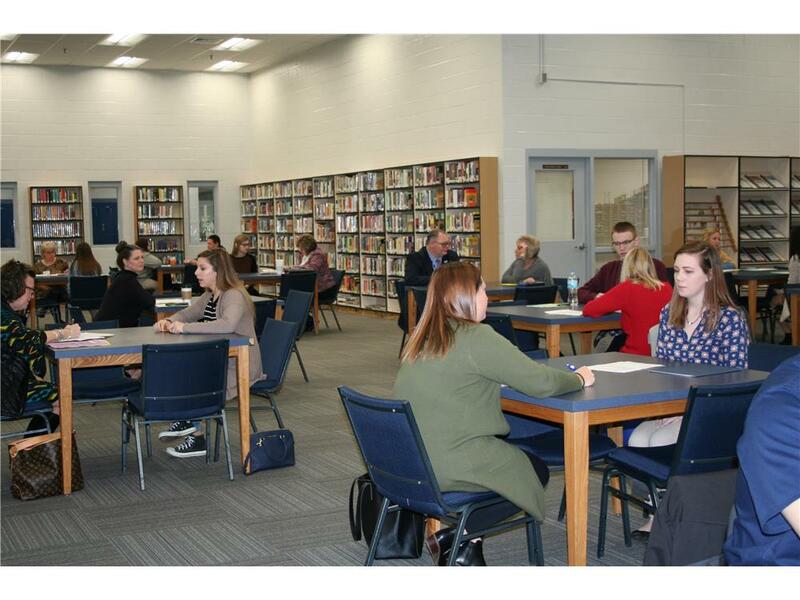 In an effort to provide an education that better prepares students for life after high school, Logan County High School engages seniors in a yearlong plan of study that addresses many of the challenges they might face following graduation. The plan provides students with opportunities to learn more about their unique fields of interest and a chance to develop skills and materials that will aid them in their future endeavors. As a part of this plan, seniors recently participated in a daylong event that served as one of the program’s culminating activities. The event, titled Senior Summit, welcomed community representatives from a variety of professions and institutions as well as recent LCHS graduates into the school for a chance to meet with seniors. During the day, participants attended four small group sessions. In one session, students met with representatives of vocations they had previously identified as careers they planned to pursue. Students were next given an opportunity to meet with representatives from other areas of interests. Presenters provided information concerning their respective fields along with the demands and unique qualifications one would need to attain a career in that field. In other sessions, students had opportunities to meet with college representatives. During these sessions, they had the chance to discuss financial aid as well as other issues a potential college freshman might have. Several former LCHS students were also available to discuss college life. Throughout the day, seniors were also engaging with local business leaders through one-on-one mock interviews. During the interview portion, students shared the resumes and cover letters they had worked on during the first semester. At the interview’s conclusion, the interviewer provided feedback to the potential employee. LCHS appreciates the help from the following listed local business leaders involved in the sessions and interviews: Brendon Sheehan- GM/ Corvette plant; Rachel Armstead; Matthews Construction; Costello Stone; Bowling Green Department of Transportation- Civil engineer, Joseph Plunk & Chis Warden; Logan Aluminum- Jacob Hopkins, Jalee Page, and Trevor Brown; Reliance Agriculture- Travis Hurt; DDI Engineering- Justin Hopkins; Southern States- Tim Markham; DCBS- Amber Ledbetter, Amy Moyers, Paula Washington & Kasey Reynolds; WKU Healthcare Department- Dr. Danita Kelley; Health Department- Kelly Lyne; Holly Barrow; Logan Memorial Hospital- Steve Matthews; Hargis & Associates- Melodie Bingham; First Southern National Bank- Holli Black; Auburn Bank- Sandra Kinser; SKYFame SKYCTC Franklin Center, SKYFame & Logan Aluminum- Steven Cross; H&H Sheet Metal- Ethan Holloway; Pennyrile Electric; Brooks & Hendricks Lawf irm- Ami Brooks; Dr. Ellie Gripshover; Mark Cooke; SKYCTC Culinary Department- Tammy Inscoe; University of Kentucky; Murray State University; SKYCTC; and Western Kentucky University.